Our patented Exo-Frame technology is designed to make installation faster, cheaper, and smarter. 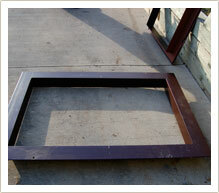 Exo-Frame’s single-piece design allows for a quick and sturdy installation compared to conventional wood-framed units. The Exo-Frame is pre-sized to the final window opening and fabricated in a controlled shop environment. Typical wood frame units require fabrication at the site and do not offer the superior strength qualities found in the Exo-Frame. Additionally, to allow for a code-approved egress window, wood frame designs require the removal of up to 30% more concrete from the foundation along with the original poured-in steel buck. The combination of Exo-Frame’s prefabricated frame and reduction of on-site work saves valuable time and labor costs. In a typical Exo-Frame egress window installation, the new window can be installed and sealed within 90 minutes after cutting and removing the section of wall. 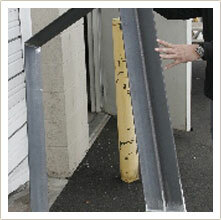 A standard 4” x 4” x 1/4” Exo-Frame can support a 3000 lb load at the center point and 6000 lbs. of overall load. Precision cut from structural iron and with bevel welded corners, the Exo-Frame is designed for superior load-bearing capacity. The Exo-Frame can be easily customized to accommodate a multi-story load or to reach a recessed rim or floor joist from the outside without adding a separate header support. 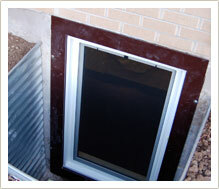 Typical egress window installations on homes with piered foundations require a steel header across the top section of the window. For homes with finished basements, this means messy, expensive interior demolition. In addition, the steel header required in a typical egress window interferes with the installation of drywall studs and doesn’t allow for a smooth finished trim. But the Exo-Frame’s engineered design works equally well on homes with piered foundations and continuous footer foundations. The superior load-bearing capacity of the Exo-Frame eliminates the need for a separate header and allows for a quick and clean installation from the exterior of the home. Because the Exo-Frame requires minimal caulk and no paint or adhesives, your egress window can be installed equally well in winter or in summer. The Exo-Frame is installed using a non temperature-sensitive gasket. 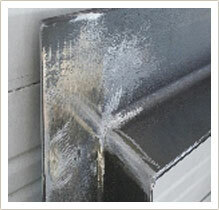 The integral design and easy installation means the home is open to the weather for only a short period of time. The sleek, single-piece design of the Exo-Frame virtually eliminates the lips, joints, and edges of a traditional wooden frame and wood exterior trim. With no place for moisture to collect, it’s nearly impossible for water to seep behind the frame and cause rotting, damage and leaking. 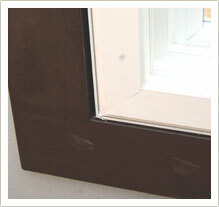 Conventional installation of an egress window requires additional exterior wood trim to seal out the elements. 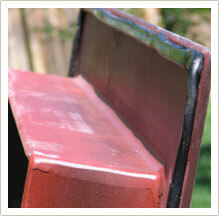 This high-maintenance trim in a naturally damp environment requires caulk, glue, and paint. By design, the steel Exo-Frame is secured into the opening with plated pins and a butyl gasket directly against the foundation wall. By sealing the installation from the inside out rather than the outside in, the Exo-Frame offers a confident and worry-free seal that is highly compatible with fiberglass, vinyl or aluminum-clad wood windows.